We started from Dalhousie and reached Katra at about 3:30 pm. 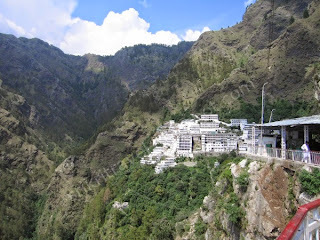 Vaishno Devi temple is 12 km from Katra. 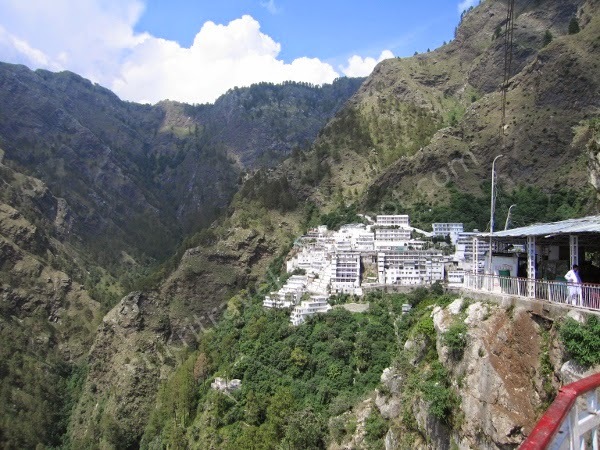 In order to visit Vaishnavi Devi Temple, it is mandatory to get the yatra parchi (Registration slip) at Katra. We took some rest in the hotel and went to get the yatra parchi at 5 pm. By the time we reached, there was a huge crowd waiting in the queue. Suddenly, the counter was closed and the cops in the information center made an announcement that the counter will open only the next morning 5:30. Since, we did not have any other option, we went around nearby market and purchased few dress materials, few kilo of walnut and other dry fruits. The next day we got up at about 4 am and went to get the yatra parchi. By the time we came out of the counter it was about 6:30 in the morning. There are several ways to reach temple. One can take pony (Horse ride), a palanquin, helicopter or by walk. We decided to walk to and fro. So we packed glucose and started walking. On the way to temple there are umpty number of food/tea stall. We took break every now and then and had glucose. At about 6th km (the mid way to Vaisho Devi temple), one can find the place called Ardhkuwari (also known as Garbh Joon). We enquired for the ticket to visit Ardhkuwari, but the person in the counter did not guide us properly. Hence, we thought that we could get the ticket while returning from temple and can have a darshan here. Then we proceeded to temple and reached Vaishnavi Devi at 12:30 pm. We deposited all our valuables in the locker and then went for darshan. Here the three rocks cut statues representing Goddess Saraswati, Goddess Lakshmi and Goddess Kali are present. We came out at 2:30 pm and on the way back we had lunch. After lunch we reached Ardhkuwari and got the ticket. But there was heavy rush. When we enquired in the counter they said our turn for darshan will come only the next day. As we did not have enough time we had to skip this. We were so tired that our legs started paining severely and we were restless. We took buttermilk to energize our-self and reached room at 6 pm, took some rest and then had dinner.